I have ticked 'index hierarchy ' but it just shows the deepest term e.g. "Tax A child of child"
I'm presuming you are using FacetAPI and Search API Solr. Not the answer you're looking for? Browse other questions tagged search hierarchical-select or ask your own question. How to replace an unfiltered Search API results view with custom text? 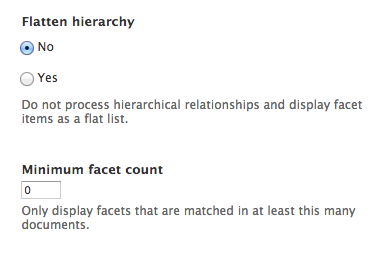 How to interpret the components exposed by Facet API in Features?